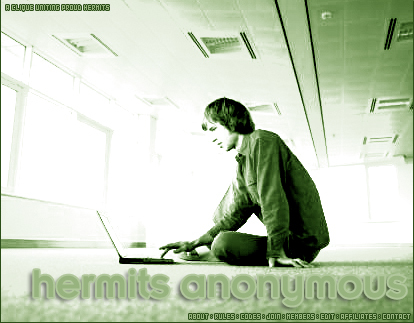 Welcome to Hermits Anonymous, a clique started by me, Skyler, as a means to unite other homebodies that lurk around online. This clique was designed in hopes that other homebodies like myself would "come out" and forget about what everyone else thinks. Although I do frequently leave the house and would not be considered an actual 'hermit,' most of my hobbies are indoor activities and I generally prefer the indoors as opposed to the outdoors. I get ragged on a lot for it, but I really do not care what anyone else thinks. People call me a hermit and anti-social--of which I am neither--but I will live my life the way I want to live it, and I am sick of other people telling me it is "wrong." If I want to waste hours sitting at my computer, I will. If I sometimes prefer an online conversation to one in person, oh, well. I believe that you should be able to do whatever makes you happy. My room is my haven and it is where I spend the majority of my time. This clique is for those who enjoy solitude, independence and the indoors. It is for those of us who just feel more at home in our rooms than at a mall or a party. It is for those of us who are not necessarily anti-social but who sometimes prefer the pleasures of the online life rather than real life. If you too spend most of your time indoors, locked away in your room, probably at your computer screen, feel free to join this clique and show your hermit pride! Please note the the term 'hermit' in this clique's title is just meant lightheartedly. For most of us, we do leave our homes, but it is meant to be an overexaggeration.